Aqua, Aluminium chlorohydrate, PPG-15 stearyl ether, Steareth-2, Cyclopentasiloxane, Prophylene Glycol steareth-21, Parfum, Cyclohexasiloxane, Benzyl salicyalate, allantion, Linalool, Butylphenyl methylpropional, Citronellol, Alpha-isomethyl ionone, hexyl cinnamal, Geraniol. 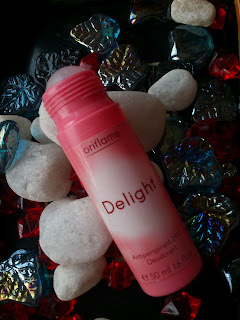 Oriflame Delight Antiperspirant comes in cute pink girly sturdy package. It is very travel and user friendly. It is very cute pack, and I will carry around this with me. It delivers very nice fragrance. I loved it just and always wears after my bath. It controls Sweat nicely. This Deodorant is one of my favorite list. It is a easy roll on used in under arms. The smell of this is just long lasting very fine. It never irritates my skin. I am addicted to it's fragrance very much. I feel fresh after wear this. 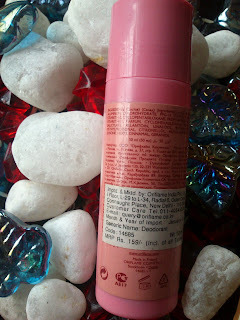 There is no white patchy or allergy because of this Oriflame Delight Antiperspirant. I love alcohol free body sprays and deodorants always. Always choose rose like mild flower fragrance for evening time use, choose lemon, orange like flavors in deodorants and body sprays for day time and office use. They will induce your moods according to the fragrance. Lemon like citrus fragrances makes us feel always refreshed and energetic. The rose, lavender body sprays will calming the mood and can induce romance feel, they are best for evening time use. I personally like lemon like citrus fruits flavors in body sprays, I also like rose and lavender. I choose always alcohol free body sprays which is safe and good for our skin. They won't irritate our skin and don't give white patches too. Also I concern about paraben presence in any products and I recently read in an article that paraben presence in body sprays can cause breast and skin cancers. This is horrible and not at all a good news for a continuous body spray users like me. Never cause any allergy on my skin. Cute and travel friendly pack. Can get through only by consultant. Hope this review will be helpful for you all. Thank you dear...I have an eye on Giordini gold one Niesha... I have heard it is also good..